Let the Rewind Wireless Retro Headphones take you back in time to when grunge, big hair, bright colors and kicking it with your Walkman was the thing to do. Now it's time to GO wireless. The Rewind headphones provide 12 hours of playtime, custom EQ3 Sound, and all of the controls you need. 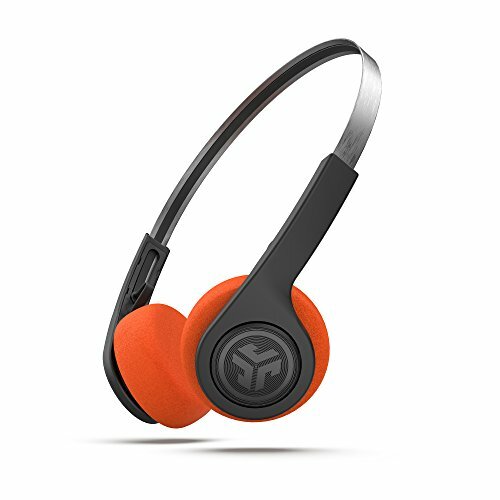 The same lightweight design and orange foam earpads, you'll feel more nostalgic than ever. Old-school look, with today's technology. Keep the 80s/90s and more music GOing for sick 12 hours of Bluetooth playtime. Use the included micro USB charging cable to charge back up after you've jammed all day. Our radical EQ3 setting lets you change the sound to your preferred tune via the headphone so your music sounds just right. Click between three options: JLab Signature, Balanced, and Bass Boost. Let the Rewind take you back in time. Change the foam ear cushions between two fun colors to keep the look old school. An adjustable headband provides even more comfort than before. For those need to know moments, a double click and digital MEMS built-in microphone lets you activate and deactivate SIRI, Google Assistant, or other voice assistant prompts as clear as day. One Year Warranty and expert support included! If you have any questions about this product by JLAB, contact us by completing and submitting the form below. If you are looking for a specif part number, please include it with your message.